OK, dogs may not really hate the mailman, but let’s face it: barking at the mailman seems to be a dog’s favorite hobby. As soon as the truck arrives, otherwise friendly Rover turns into a barking beast and starts lunging at the window or gate as if dealing with his worst enemy, what gives? The above cliche’ is so widespread that postal service employees have started attending seminars on safety around dogs and sometimes carry products to keep dogs away. Until dogs can talk, we may miss out the exact reasons as to why they react in such a way, but we can make some educated assumptions. 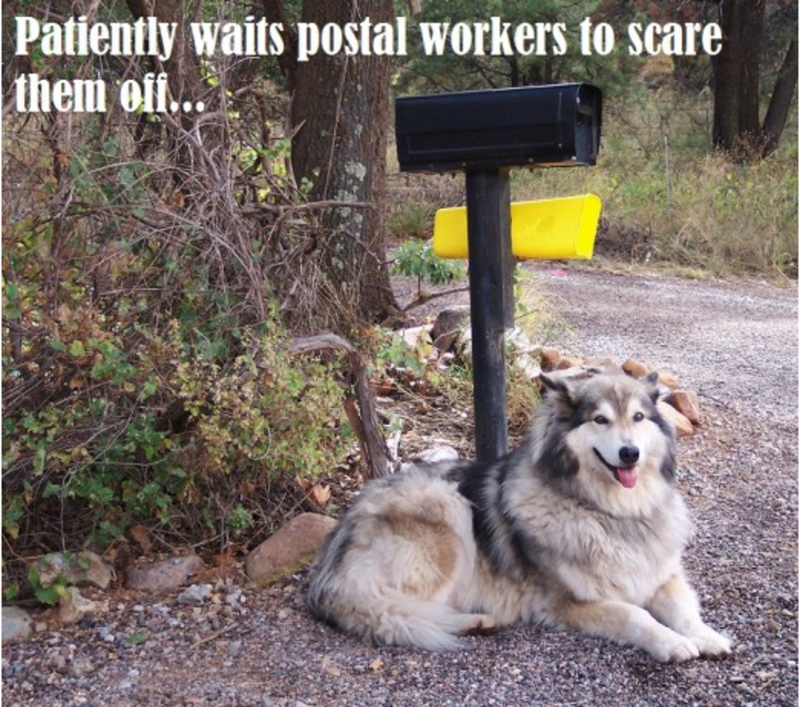 So here are some reasons why dogs may “hate” the mailman. So Rover, what’s the matter with the mailman? He’s Coming Into My Territory! No offense, it’s not only the mailman. Dogs may react in similar ways towards the UPS and Fedex workers, the pizza delivery guys and the plumber, electrician and the poor fellow who comes into your home to fix your cable TV. It’s not a matter of who, but a matter of what these people do. What do they do? 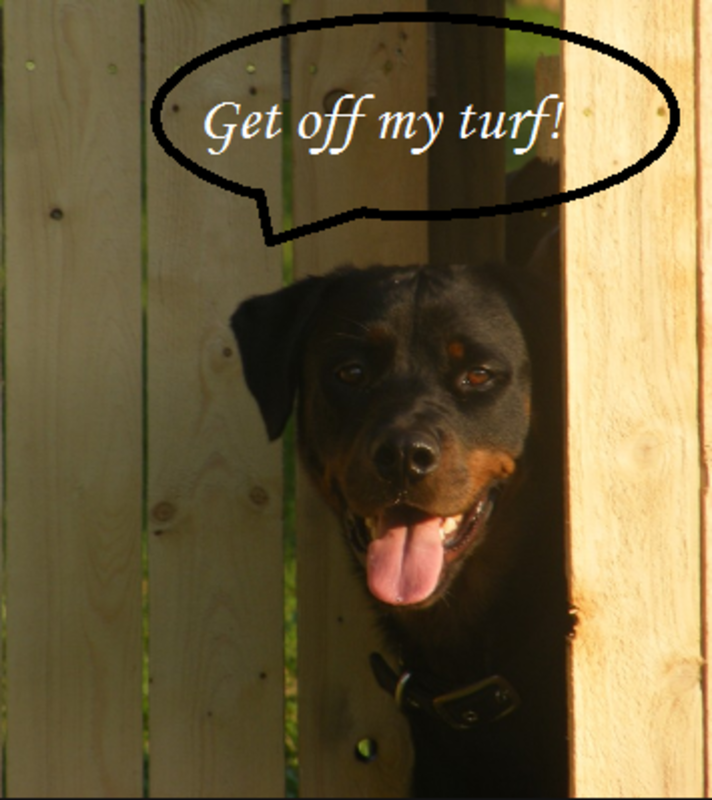 From a dog’s perspective they are intruders who are trespassing property. They are loud, uninvited and don’t stop by to say hello. Many dogs have a natural inclination for passively alert barking and some may engage in a more active approach that’s meant to protect territory. There is likely also an element of fear at play when it comes to territoriality, but shhhhh… dogs don’t want you to know about this! Why they do this: The behavior may be reminiscent of the old days when the dog’s ancestors lived in packs and they had an innate tendency to be alert and protect their resources through urine marking and more active displays tended towards intruders who weren’t part of their social groups and ignored their scent marks invading their “no-passing zones.” When dogs were domesticated and used in villages, their watch dog tendencies were further appreciated. Dogs were selectively bred for their ability to bark when they spotted dangers such as predator animals or enemies. Still as today, many dogs are still appreciated for their alarm barks, even though nowadays a more active role may be frowned upon due to its potential for liability. What makes dogs really upset about postal workers is that despite all their barking directed towards these delivery guys, they keep coming back and gain no validation as other guests entering the home. These postal workers therefore risk gaining the status as eternal intruders and they fail to hang around long enough for your dog to get accustomed to them, but let’s take a closer look at the dynamics through Rover’s perspective. Why they do this: The dog sees the mailman so he starts barking, and every time he barks, the mailman leaves (because that’s part of what mailmen do, deliver the mail and then leave to continue their jobs). From Rover’s perspective, his barking is what is making the mailman leave and therefore it’s highly reinforcing. You can almost hear him thinking out loud “Hey, intruder, get off my turf, you hear me?” So when the mailman leaves, the dog feels some relief, “Phewwww, finally got rid of that intruder!” So every time the mailman comes over to delive mail, Rover will stick to his barking behavior, and if the mailman doesn’t leave right away, he may even add some lunging, growling or snarling into the mix. To put ourselves in our dog’s shoes, let’s imagine the following scenario. Every morning, a cat comes into your yard. You like cats, but many stray cats are fixated on urine marking your favorite flowers and wall, leading to a terrible odor. So one day you start making a hissing sound to send the cat away. The cat flees promptly upon hearing the sound, so most likely, since it worked, you’ll keep hissing the next time you see the cat approaching your property, but what happens that day a bolder cat approaches and he cares less about your hissing noise? Most likely, you’ll experiment with something else so you may start stomping your feet loudly along with the hissing. Tada! Now, next time you’ll likely hiss and stomp to get rid of the next feline intruder. When dogs are allowed to rehearse behaviors over and over, they are destined to become habitual. This means they’ll be barking at the mailman every single time. Why they do this: Dogs are habitual creatures that tend to repeat behaviors that work. Day after day, the barking becomes almost reflexive and it takes just the noise of the truck to elicit barking, without thinking twice. Not only, there are also chances that the behavior may become even a tad bit addicting. On top of the barking becoming highly reinforcing, it’s possible that associated emotions of fear or anger cause the release of chemicals in the dog’s brain. This whole experience can become physiologically addictive. James O’Heare, in the book “The Canine Aggression Workbook” explains how this chemical bath can become quite addictive, which explains why certain behaviors tend to repeat over and over. When it comes to fear or aggression, it can generalize quite quickly like a forest fire. Your dog may bark at the mailman, and then his behavior may generalize towards other postal workers, then next, is the pizza guy and then comes the electrician. Also, the barking behavior may also happen earlier and earlier as the dog chains one event with another. So while the barking originally started when the mailman would park his truck in front of your home to place the mail in the mail box, after a few days it could evolve to barking at the mere sound of the truck approaching. So it’s not surprising if soon, not only will dogs bark at the mailman but also to all the anticipatory cues that suggest his arrival. So just like a small spark can trigger a fire, the barking behavior can evolve and get out of hand, and the more time lapses, the more the behavior can become difficult to extinguish, so here are a few tips on nipping the behavior in the bud. Start early. With this type of training you can’t start early enough. If you have a puppy, make sure you socialize him to all types of people (children, babies, teenagers, the elderly, people wearing hats, people wearing uniforms, people carrying stuff, etc) Let people visit your home, make it fun and rewarding and teach your puppy it’s perfectly fine to have people over. As soon as your pup sees people approaching your home, ask him to sit and give him a cookie. Do this frequently enough, and your pup will come to realize that great things happen when people approach your property. 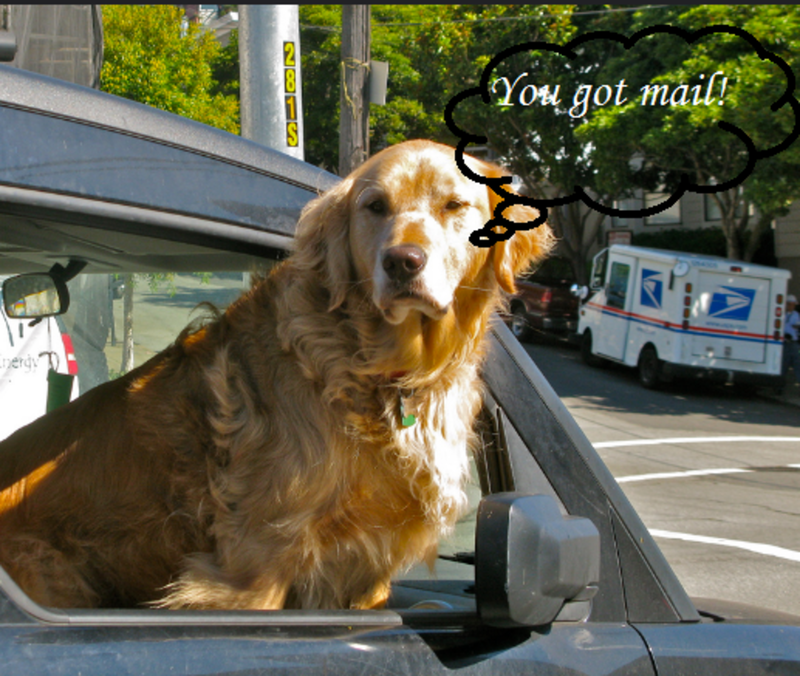 To teach your pup to love the mailman, introduce him from a young age. If your pup is hanging around the yard, place a cookie in your mailbox and ask your mailman to deliver it to him every morning. After some time, you may notice tail wags and possibly barks of happy anticipation! Prevent Rehearsal. If you missed the train and failed to teach your dog to love the mailman, you may have more homework to do. A good place to start is preventing rehearsal of barking behavior before it becomes too ingrained. This is done through management. So stop allowing your dog to rush out and bark his head off at each delivery. Keep him indoors and cover your windows with window film, if your dog rushes to the window to bark. Keep your dog in a room that’s far enough from street sounds. Create Positive Associations. Secluding your dog to a room from which he can’t see the mailman, may do nothing to curb the behavior, but it’s a starting point as you plan on working to change the behavior. The goal is to change your dog’s emotions about the mailman changing him from foe to friend so that he feels like welcoming him instead of sending him away. First, you will need to find a distance from which your dog doesn’t react much, next you will need to gradually and systematically expose him while feeding high value treats at the sights and sounds of the approaching mailman. Once he is gone, make all the goodies stop. Good things happen only when the mailman is around, get it? So now instead of being worried about these intruders taking away resources and invading property, now these postal workers are welcomed and become actual sources of resources! Did you know? Patricia McConnell in her book “The Cautious Canine” suggests having the pizza delivery guy come to your home and deliver a slice of pizza just for your dog to create positive associations. Warning: always make safety your top priority! 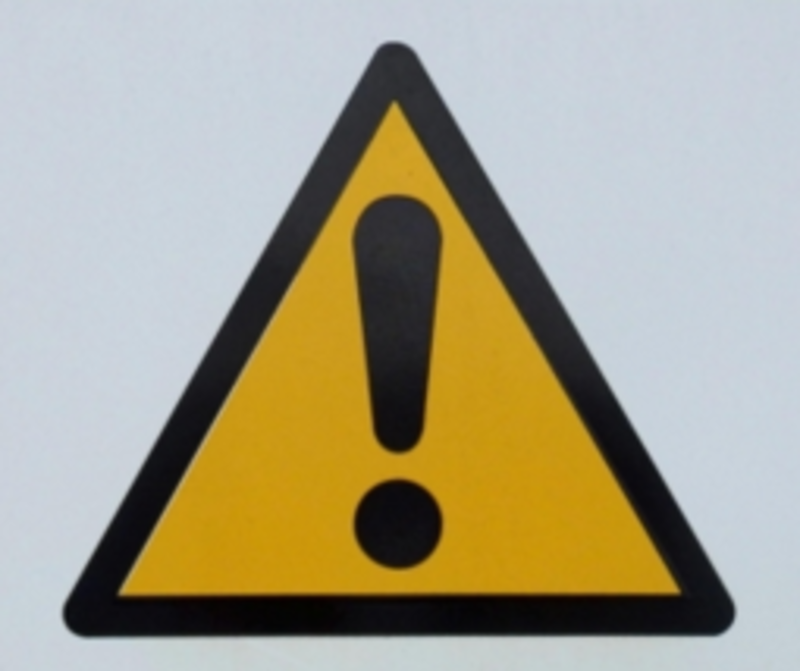 Behavior modification can come with risks for you (re-directed bites) and others. 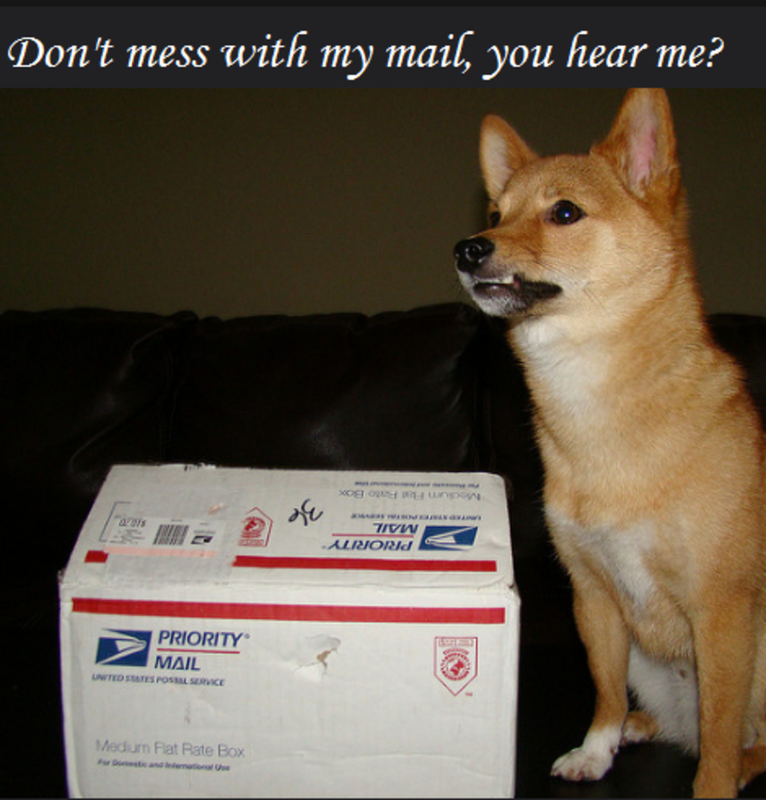 Never let your dog free to greet the mailman no matter how much he has progressed. Doing so can potentially hurt your mail man. If you have given your dog treats every time he sees the mail man and you wish to progress and have your mailman hand feed them, it’s best to have your mail man toss them safely through the fence rather than having him risk being bit from direct exposure! If your dog is aggressive in any way, please consult with a veterinary behaviorist, a certified applied animal behaviorist or a force-free trainer well-versed in dog behavior modification.